I hit the green carpet for 'Tarzan' the Premiere! One of the best things about being a Journalist is working in radio. I love working covering premieres and previews on red carpets - or in this case green carpet! I covered the Tarzan Premiere in The Odeon in Point Village for In Colour on Rte 2xm. I interviewed Twilight star and 'Tarzan' himself Kellan Lutz. Kellan played tough guy Emmett in the Twilight saga but in person was soft spoken, friendly and a dream to interview. He divulged how he loved Tarzan and Disney movies like the Jungle Book as a little boy. I was accompanied by photographer Emma Ratcliffe of Travel Style Food. 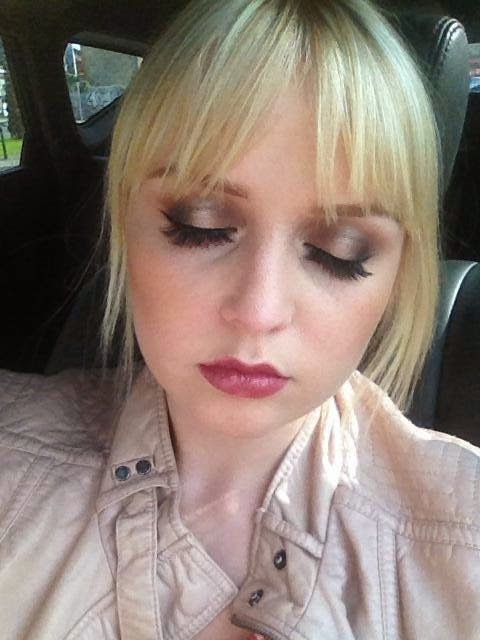 Thanks to pro make up artist Breifne in Inglot Make Up Ireland Dundrum. She dolled me up to cover the Tarzan premiere! The carpet was green in honour of the occasion. There were hundreds of little kids all lined up enjoying the pre- movie festivities. Fruice were giving out Juices and there were snakes and many other jungle animals on the scene. There was a very fun childlike atmosphere befitting the tone of the movie. The Young actor is jetting all over Europe promoting Tarzan and enjoyed soaking up the sunshine on his trip to the capital: "Its good to back in Dublin. It is the first time I have been here and it isn't raining! I love it"
"Motion capture is a lot of fun because stand aside hair and make up - for a guy like myself I don't care for hair and make up and for motion picture you get to throw on the suit and act in an imaginary world that you create. There is no set dressing so you have to visualise the trees being here or a butterfly or a vine. You get to play in a fantasy world." I asked Lutz did he love Tarzan growing up, he explained how he did and that he feels like "every little boy had those colouring books and watched Disney movies. I loved Tarzan, Mowgli from 'The Jungle Book', Simba from 'The Lion King'. I think every kid acted like an animal from their favourite movie and to be an actor and to bring these heroes to life - Tarzan being the top of that food chain for me- was very special and a childhood dream for me." Kellan Lutz has had a quick descent into stardom with skyrocketing into the spotlight as buff vampire Emmett in The Twilight Saga. I questioned what that felt like - after working on Twilight, Hercules and Tarzan to be in demand: "I'm extremely grateful. Really blessed. You set goals for yourself in any occupation to have something to drive towards. For me as an actor I would pick roles that are iconic, that I am very passionate about. Life is very short so I would rather do work that doesn't feel like work. In the movie world it takes about 2 years for any film to come out by from start to finish. So it is a lot of time to dedicate to put yourself in a project and not in other ones. I am delighted to have brought 2 of my childhood heroes to life. I'd love to play He- Man!" Lutz has some exciting movies he has been working on. The Expendables 3 is coming our Aug 15th. The Hollywood star is also producing a lot of action films at the minute and a passion project of his 'Redeeming Love' will be released soon. 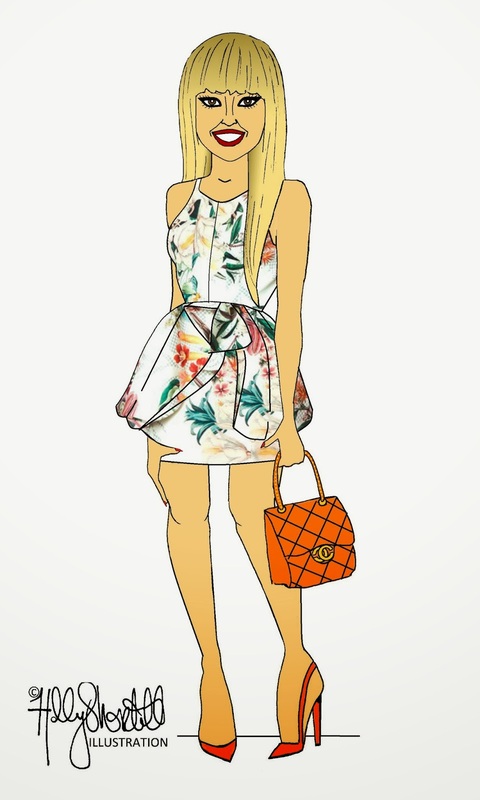 Illustration of me by Holly Shortall! Massive thanks to the super talented Holly Shortall for this cool illustration of me! I am wearing my Cameo the Label dress from 3NY I picked up in Soho in New York during Fashion Week in February teamed with an orange chanel bag. I really cannot wait to use it on my official website. Holly is ridiculously talented. 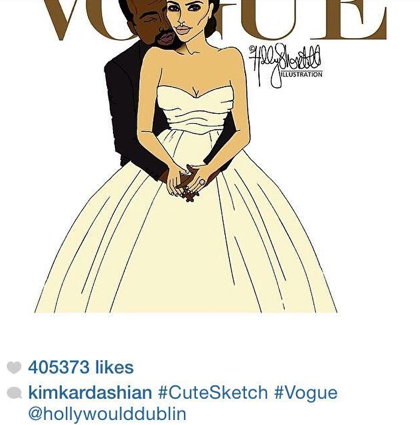 She was all over the press this week after Kim Kardashian reposted one of Holly's illustrations and it literally got almost half a million likes. 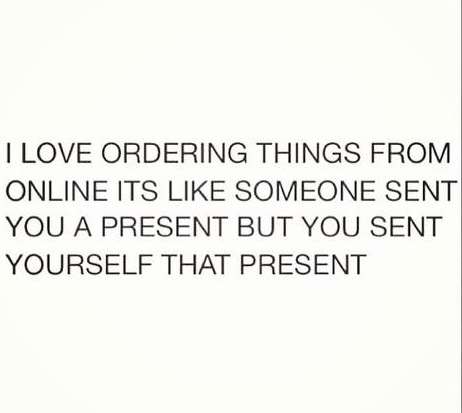 No mean feat. Be bold, be brave & misbehave! Win a 3 month subscription to Glossybox! As all you dolls know I am a Glossybox lover. I am like a child at Christmas when the postman comes with my monthly delivery of beauty treats! Lipstick Gossip and the fabulous folks at Glossybox have teamed up to offer one of you lucky ladies a 3-month subscription to Glossybox! Each month, Glossybox sends you a carefully selected range of five must-have beauty products, all beautifully wrapped in the signature pastel pink box and send straight to your home. Brands featured in Glossybox this year include Givenchy, Nuxe, John Frieda, Sarah Chapman, Figs & Rouge and many more. You can enter this competition on Facebook or twitter. 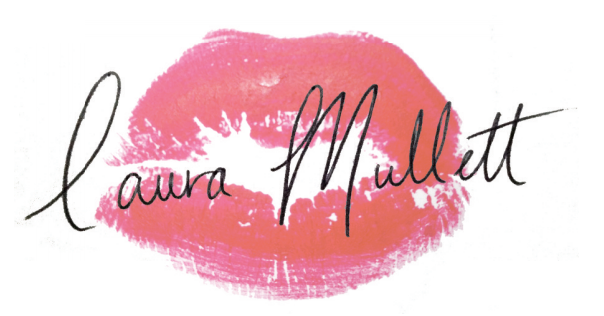 To enter on twitter: Follow www.twitter.com/GlossyboxUK + Follow www.twitter.com/lauramullett & Retweet the #glossybox competition tweet on @lauramullett to win. To enter on Facebook: 'Like' www.facebook.com/Glossybox + 'Like' www.facebook.com/lipstickgossip and 'Like' + 'Share' the glossy box status on 'Lipstick Gossip' to enter. Finally - comment to say 'done' + tag 3 Facebook friends. 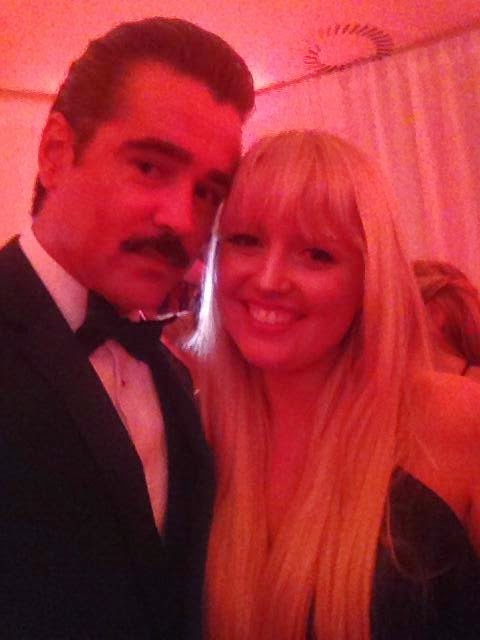 My interview with Colin Farrell! The creme de la creme of Irish talent & international stars came together in the Double Tree Hilton in Dublin to celebrate the 11th annual Irish Film and Television Awards. 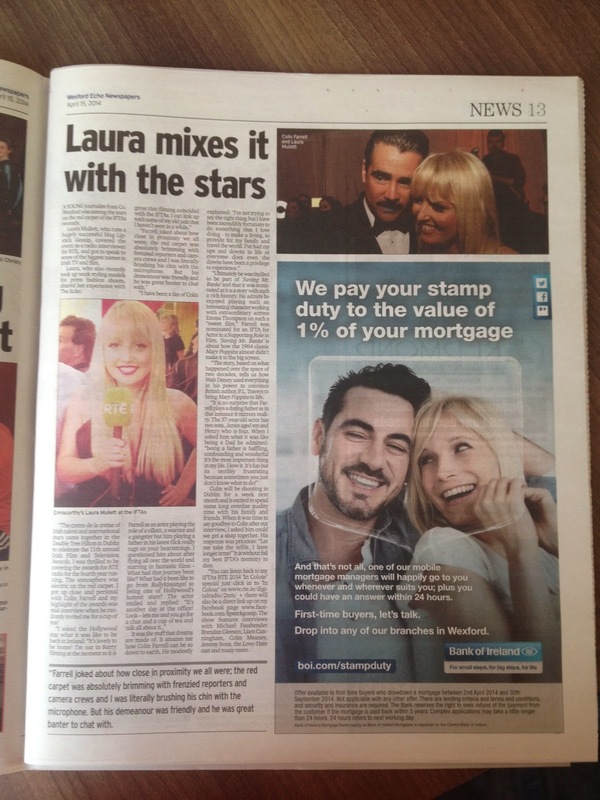 I was thrilled to be covering the awards for RTE radio for the fourth year running. The atmosphere was electric on the red carpet. I got up close and personal with Colin Farrell and my highlight of the awards was mid interview when he randomly invited me for a cup of tea! Colin will be shooting in Dublin for a week next month and is excited to spend some long overdue quality time with his family and friends. When it came to say goodbye to Colin after our interview I asked him could we get a snap together. His response was priceless. “Let me take the selfie I have longer arms!” It is without fail my best IFTA’s memory to date. www.rte.ie/digitalradio/2xm/ + there will also be a direct link up on my facebook page www.facebook.com/lipstickgossip tonight. The show features interviews with Michael Fassbender, Brendan Gleeson, Liam Cunningham, Colm Meaney, Jeremy Irons, the Love/Hate cast and many more.